It’s that time of year when hints of THE season start to permeate our thoughts. 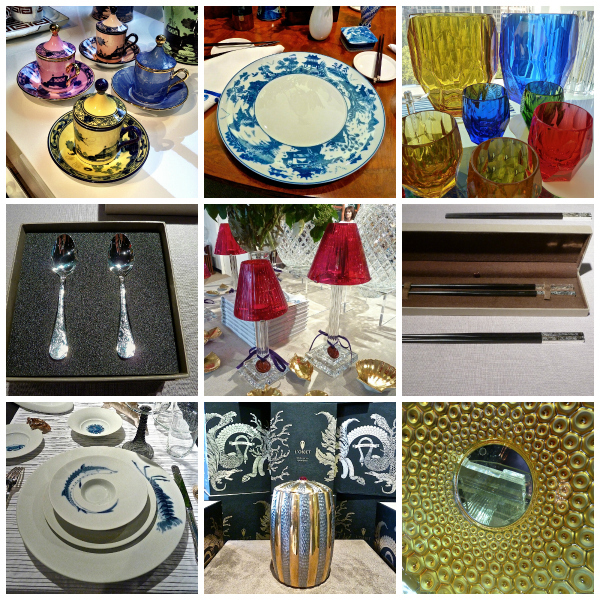 This week is tabletop market so I spent the day perusing the showrooms. And while most of the offerings at the show are for next spring, I thought I’d present a teaser peek at some gifting and entertaining ideas that are available now or very soon. Hopefully there will be time to take a closer look but I also have an enormous pile of fabulous fall books to review so stay tuned for the onset of the temptation and don’t feel guilty if you some of the gifting is for yourself! From top to bottom, left to right, Richard Ginori, Mottahedeh, Mario Luca Giusti, Christofle, William Yeoward, Christofle, Hering, l’Objet, Lalique. This entry posted in holiday, interior design. Entry Tags: Entertaining, gift ideas, Tabletop, tabletop gifts Bookmark the permalink. Such beautiful items to grace our tables. Wishing we had the Hering Berlin pattern in Beaufort! Oh how we love a beautiful design book! Ah those Ginori teacups are so lovely! Thanks for sharing Stacey I would be thrilled with the Mottahedeh as well! 78 queries in 0.475 seconds.